Leading asset management firm Quilter Cheviot has announced the appointment of Sam Jacobs as a Business Development Manager (BDM) in its London office. Fluent in Mandarin, Jacobs will specialize in working with portfolio advisers and Chinese clients seeking to obtain a Tier One Investor Visa. In this newly-created role, he will support the business in augmenting its services for clients in this market, smoothing the process of becoming a Tier One investor in the UK. This will include regular consultations with solicitors and lawyers on behalf of clients and provision of translation services. Prior to joining Quilter Cheviot, Jacobs worked as a Regulated Advisor for 15 years. His most recent position was as a Financial Planner at London & Capital. Prior to that, he worked at Charles Stanley, also as a Financial Planner. He has also held positions at the Bank of Scotland and American firm Edward Jones. Educated at the University of Leeds, Jacobs studied Mandarin, Chinese and Japanese as an undergraduate, and more recently completed an MBA at Warwick Business School, in which he focused on the provision of financial advisory services to the Chinese market. He is also a Chartered Wealth Manager. 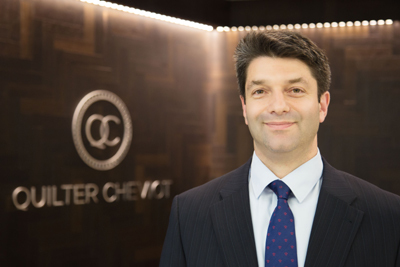 Discussing Sam Jacobs’ appointment, Martin Baines, CEO, said: “Chinese clients are drawn to Quilter Cheviot because of its 200-years of proven success, and its reputation as a ‘safe pair of hands’ when it comes to investment. “Each international market has its own idiosyncrasies, and a good understanding of its language, culture and nuances of investor behavior will always be key to enriching how a business can operate there. Quilter Cheviot focuses primarily on structuring and managing bespoke discretionary portfolios for private clients, charities, trusts, pension funds and intermediaries. The company is one of the UK’s largest independently owned discretionary investment firms, tracing its heritage back to 1771 and is based in 12 locations across the UK, Jersey and Ireland with more than £15.7bn* of funds under management.